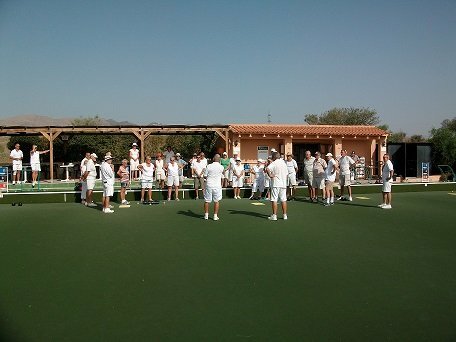 MCC are the Motor Caravan Club UK staying on Los Gallardos Campsite early June and apparently they´ve played Almeria once before? I managed to shoehorn a challenge game into our commitments within 10 days’ notice. John Fitz (non-player) thought because of our player’s competition commitments, the best way to run this competition was to train their non-bowlers during the game itself. This was done giving them basic tuition for literally one end up & one end back. Our Ladies with their Ladies and our Men with their men played each other. Mike (Michelle) Hendry & Terry (Theresa) Rogers batted for the other ladies team for the day. So throughout the chaotic but hugely enjoyable game, everyone coached everyone, regardless of team loyalties. We then brought the whole thing to a close at about 12:30, because everyone was getting very hot bothered. Everyone then retired to Miraflores terrace and stopped a few going bad??? Grudgingly, we had to admit that the Ladies had beaten the Men by 2 points overall, however it didn´t matter and it was just one lot of nice people playing WITH another lot of nice people! I also think we may have picked up at least two potential new members??? So watch this space? 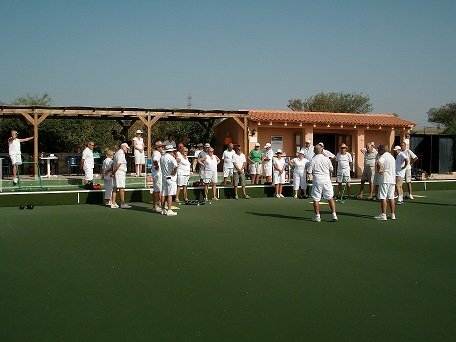 Photographs were taken and will be posted on our website www.bowlingalmeria.com together with the report. hHzPyF This blog was how do I say it? Relevant!! Finally I have found something that helped me. Kudos!